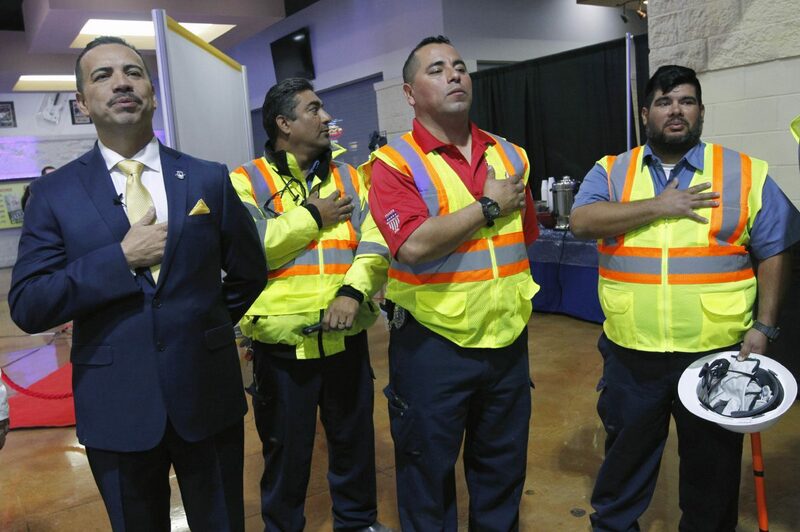 City of Pharr mayor Ambrosio Hernandez, left, stands with city public works employees Salvador Ramirez, Juan Ruiz and Noe Alvarado before delivering the 2018 Pharr State of the City Thursday, January 18, 2018 in Pharr. 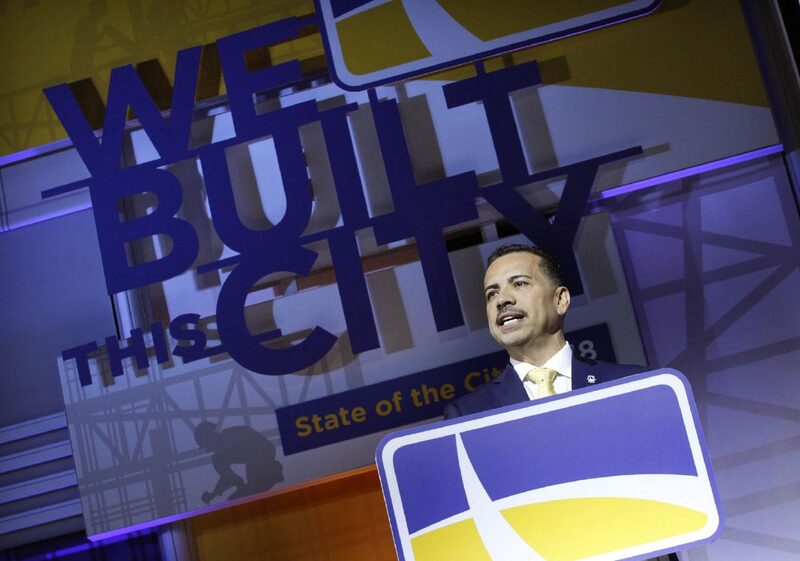 PHARR — Led by small children wearing hard hats and safety vests, Mayor Ambrosio Hernandez walked into the Pharr Events Center on Thursday to deliver Pharr’s second State of the City address, with the slogan “We built this city” displayed prominently behind the podium. After a video introduction from Sen. John Cornyn, R-TX, who Hernandez praised throughout his roughly 30-minute address, the mayor took the stage and listed recently completed projects such as the 60,000-square-foot Index Fresh avocado ripening and distribution facility and an upward of $1 million research and development center on the south side of town. Hernandez touted the city’s crown jewel, the Pharr-Reynosa International Bridge, which Bridge Director Luis Bazan noted in a video has seen a 12 to15 percent growth in imports and exports. The mayor focused a large portion of his speech on current construction, such as the sports entertainment venue Topgolf, which broke ground last week, as well as future projects, such as the $150 million Pharr Interchange expansion and a University of Texas Rio Grande Valley aquatics center. Hernandez also unveiled a new city seal. 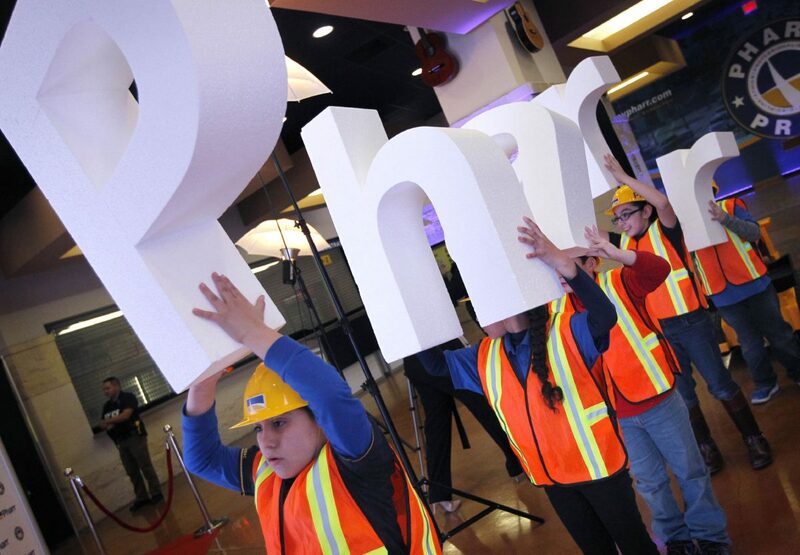 Meydali Ontiveros, left, 9, holds the "P" in Pharr while wearing a construction outfit with other children at the 2018 Pharr State of the City address Thursday, Jan. 18, 2018, in Pharr. The city highlighted new projects under construction this year in Pharr. However, the address, and buildup, featured a couple complications. While Hernandez mentioned the southbound and northbound truck-crossing success of the bridge, southbound car crossings have dipped significantly, which has concerned Pharr Bridge officials and board members. Comparing October 2017 to October 2016, 7,666 fewer cars crossed the Pharr Bridge. Comparing December 2017 to December 2016, 12,042 fewer cars crossed the bridge. Pharr Bridge officials expressed concern about the trend at a Wednesday bridge board meeting. Anticipating the address, Hernandez also wrote a column that ran in Thursday’s edition of The Monitor where he focused on Topgolf coming to Pharr. “We are on an assertive timeline, and Topgolf is expected to open this winter,” Hernandez wrote in the third paragraph. Later in the column, Hernandez wrote, “Topgolf shall be a first-class golf-based entertainment facility that will open by July 2019.” The July date was the deadline originally established in the city’s agreement with the company, but Pharr is pushing to open the facility by the end of winter.